The 2015 AIDS/LifeCycle will be my fourth year participating in this event. 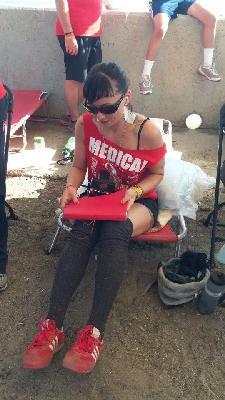 Usually, I am a roadie on the Medical Team (BEST Team!! ), but not this coming year!! It'll be my first time riding a bicycle down the California coast -and for such an incredible cause! Over 7-days, I will bike 545-miles from San Francisco to Los Angeles to make a world of difference in the lives of people living with HIV and AIDS. So, please, help me support AIDS/LifeCycle by giving what you can. No amount is too small. All amounts help hugely!! This adventure will take place May 31st to June 6th, 2015. We'll keep volunteering and riding until AIDS and HIV are a thing of the past. I will continue to be a part of this for as long as I humanly can. It is an amazing and beautiful experience. The love that radiates from the community it creates is incomparable to anything else -it's amazing! I encourage people to volunteer at least once for it --feel free to ask me anything you like! Until then, please donate what you can to this tremendously helpful cause --every dollar counts.